1. Gather your material. 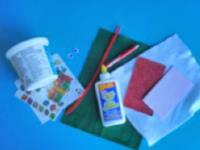 You will need Christmas stickers, green and white felt, red and light pink Fun Foam, a red crayon, a pipe cleaner, wiggly eyes, white glue and/or hot glue, scissors, and a plastic container with a lid. 2. Cut a simple elf body out of the red Fun Foam. Cut an elf face (with pointy ears) out of the pink Fun Foam. 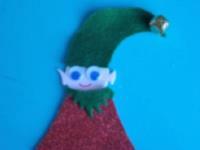 Cut a collar and elf hat out of the green felt. 3. 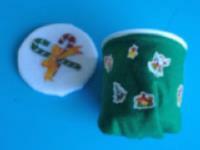 Wrap the plastic container in green felt. 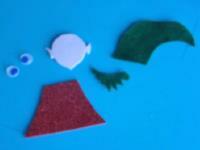 Wrap the lid in white felt. Decorate them with Christmas stickers. 4. 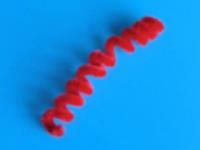 Twist the pipe cleaner around your crayon to make it look like a spring. 5. Assemble your elf as shown. Add a tiny bell to the tip of the elf hat if you wish. Use the red crayon to draw a mouth. 6. 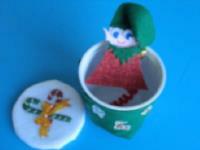 Glue the elf to the tip of the spring and glue the other end of the pipe cleaner in the bottom of the plastic container. 7. I added a large sticker representing a Christmas present on the front of the elf at the last minute. 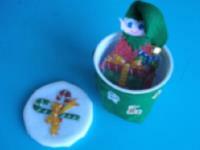 Children will enjoy stuffing the elf inside the container and hiding it with the lid and then seeing it pop out when they remove the lid over and over again.